One Flew Over the Cuckoo's Nest got its start as a 1962 novel by Ken Kesey, at the time a would-be writer who was both working the night shift at a veterans' hospital and volunteering as a subject in hallucinogenic drug experiments. Kesey was just a bit ahead of the "tune in, turn on, drop out" phenomenon, but you can see that coming in his Cuckoo world, where patients at a mental hospital are fiercely controlled and subjugated, drugged (or shocked) or otherwise beaten down to try to make them conform. 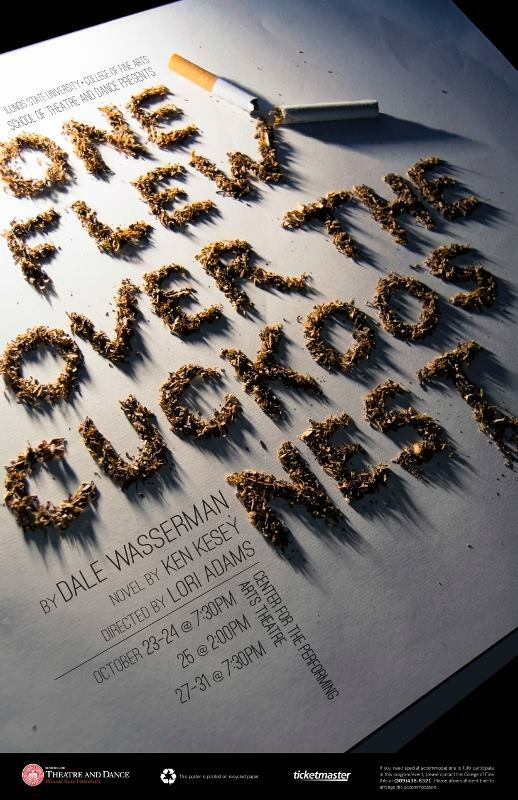 With the hit book in 1962 and a stage version by Dale Wasserman in 1963, One Flew Over the Cuckoo's Nest hit a collective nerve about the dangerous effects of repressive authority on individuality and self-expression. Movie star Kirk Douglas took the lead role of cocky, explosive Randle McMurphy in the Broadway production that featured Gene Wilder as timid inmate Billy Bibbit and Daniel Boone's Ed Ames (who was not actually Native American, but was cast as in Indian roles fairly often) as Chief Bromden, the huge, silent man who serves as the narrator of the novel and the play. It took till 1975 to get Hollywood to take on Cuckoo's Nest. By that time, Kirk Douglas was too old to play McMurphy, so he handed off the film rights to his son, Michael, who got it made with Miloš Forman directing Jack Nicholson in the lead role, Louise Fletcher as evil Nurse Ratched, Will Sampson, an imposing actor from the Creek nation, as the Chief, Brad Dourif as Billy Bibbit, and Danny DeVito, Christopher Lloyd and Vincent Schiavelli as inmates on the ward. Kesey famously dropped out of any interaction with the movie version when he found out that this story would no longer be told in the point of view of Chief Bromden, but the movie was still a major hit, sweeping the five major Oscar Awards (Best Picture, Best Director, Best Adapted Screenplay, Best Actor (Nicholson) and Best Actress (Fletcher). Lori Adams, head of the acting program at Illinois State University, directs a stage Cuckoo's Nest, with Kyle Fitzgerald as McMurphy, Kate Vargulich as his nemesis Nurse Ratched, Matt Frederick as Chief Bromden and Josh Pennington as Billy Bibbit. The rest of the cast includes Trisha Bagby, Robert Hunter Bry, Daniel Esquivel, Ryan Groves, Natalie Kozelka, Alex Levy, Lindsay Nolan, Andrew Piechota, Luke Rahtjen, Thomas Russell, Mitch Sachdev, Mario Silva and Wesley Tilford. 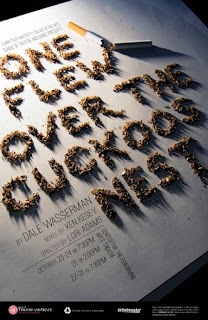 One Flew Over the Cuckoo's Nest opens October 23 at ISU's Center for the Performing Arts. Performances continue through the 31st, with weeknights and Saturday night at 7:30 pm and a Sunday matinee at 2 pm on the 25th. For tickets, you can go directly to Ticketmaster or call the ISU CPA box office at 309-438-2535 between 11 am and 5 pm Monday through Friday.